Talk about irony. Here we have an article about “fake news” from those masters of the art, the BBC. And note how the BBC seeks to portray this as history, part of government initiated wrongdoing in the past. When in fact the the UK government doesn’t have to do this anymore, the BBC does it for them now, as we explain in the footnote below. The Information Research Department (IRD) was the Foreign Office’s secret propaganda unit. For 30 years it fed information to journalists and had its own news agencies too. Almost 2,000 of its files have been transferred to the National Archives since the start of 2019. The files cover the early 1960s – the heyday of the IRD, when it employed between 400 and 600 people, according to Paul Lashmar, author of Britain’s Secret Propaganda War. In 1978, Mr Lashmar was part of the team of journalists who revealed the existence of the IRD. He says this is the first time their role faking documents has been exposed. The team was funded by the so-called “secret vote” – where government money not subject to parliamentary scrutiny was used. Part of the project involved working abroad, but it also fed information to London-based academics and correspondents. Among the newly released files are lists of trusted journalists. In 1960 that included Neal Ascherson – then a young reporter at the Observer newspaper who was introduced to the IRD by Edward Crankshaw, a more senior Soviet specialist. “I was taken to a London club and we had a nice lunch with Edward and myself and this gentleman,” Mr Ascherson remembered. The IRD information was delivered by hand and treated as secret – but Mr Ascherson said he “very rapidly discovered it was completely useless”, since it contained “stale, out of date” news. He found the analysis “childish… very cold warrior”, and says he never relied on the information. According to Mr Lashmar, the officials at the IRD were enjoying the game, competing with the other side. 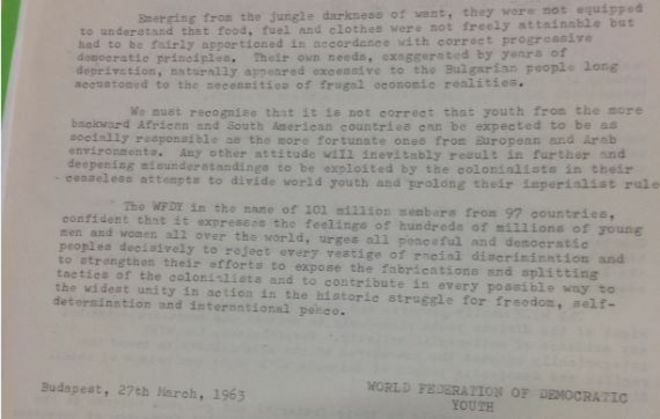 One complex scheme involved faking a press release from the World Federation of Democratic Youth (WFYD), a Communist-backed organisation based in Budapest. On fake headed notepaper, the IRD circulated a press release to hundreds of newspapers and opinion formers – sending the releases via the British diplomatic bag which meant they would have the right postmark. Some weeks later, the WFYD insisted it had been a fake release. Most of the IRD’s efforts were concentrated on foreign news, but occasionally they were employed in the UK. 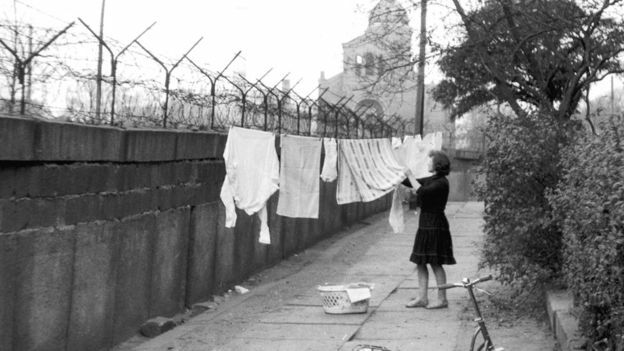 In 1962 Labour MP for Islington North, Gerry Reynolds, asked for their help. He feared his local Labour party was being taken over by “a well-organised group of extreme left-wing malcontents, probably Trotskyists”, and wanted the IRD to dig up any information on the individuals concerned. The IRD turned to the security services, which confirmed that Dorothy Hayward had been a member of the Revolutionary Communist Party in 1947; that Sidney Lubin had endorsed a Communist council candidate in 1951; and that Francis Dunne had distributed a Trotskyite newsletter. This information was “a bit stingy”, wrote one IRD officer whose disappointment suggested he had expected more information. Nonetheless, he passed it on to Mr Reynolds, who remained the MP there until 1969. It is not known what – if anything – happened to those people the IRD had named. The files show the IRD manufactured and distributed statements from the International Institute for Peace in Vienna on several occasions. 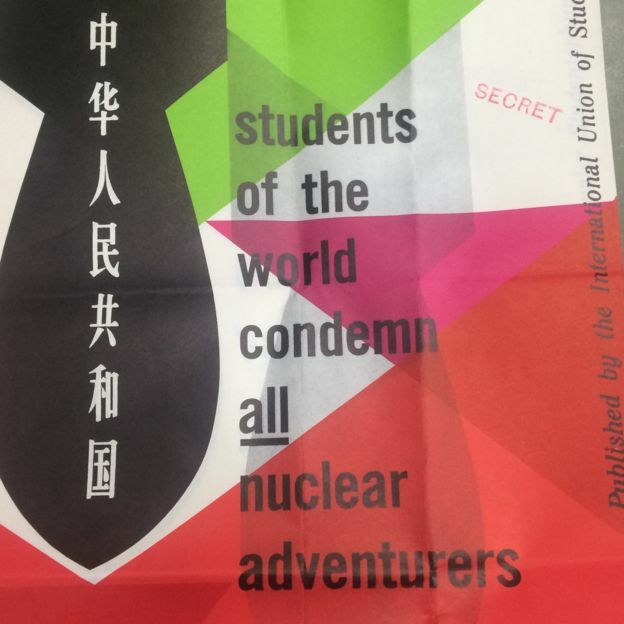 It also faked posters from the International Union of Students, replacing the acronym “US” with Chinese characters, to turn an anti-US nuclear campaign into an anti-Chinese one. This is the first time that IRD’s own forgeries have been revealed. At the time, it was keen to highlight forged documents produced by the Communists. They were known to be prolific: at one point a forged British cabinet paper was being circulated amongst African leaders. In North Korea and East Germany, such fakes were produced on an industrial scale, according to files recently released. Like they say: those who won’t learn from the mistakes of the past are doomed to repeat them, which is exactly what the BBC is doing here. However, today the BBC doesn’t mindlessly repeat contrived news reports to discredit Communists, because we now have a new enemy. “Terrorists” are the new bad guys and they are backed by whatever the western powers want to discredit and destroy. Nearly twenty years ago that was Saddam Hussein and Iraq and we know what happened in the years that followed. Then Colonel Gadaffi and Libya were labelled as terrorist supporters and the same process unfolded, meaning regime change and widespread destruction, all of which was assisted by compliant media outlets like the BBC. Thereafter, Syria’s President Assad was labelled as a terrorist supporter/human rights violator and the same process seemed to be unfolding. Or so it seemed until the Russians stepped in and stopped what had seemed inevitable. So now we are back to square one and the Russians, not the Communists this time but the Russians, are the bad guys. Trouble is in this whole charade the BBC has played crucial role and it is doing EXACTLY the same thing today. It repeats the latest government statements about whatever is deemed the latest “threat” without question or serious scrutiny. For example, in the past few years it has published numerous reports about atrocities allegedly committed by President Assad’s forces. Many of these reports were patently false. 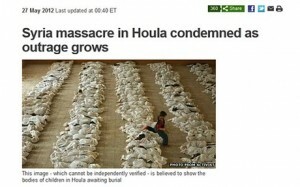 In May 2012, for example, it used photos from the Iraq conflict nearly a decade earlier to illustrate reports about an alleged Syrian massacre. Worse still, in some instances the BBC has allegedly been caught staging faked chemical weapons attacks, which were blamed on Assad’s forces and further fuelled calls for Western military intervention in Syria. So the BBC wasn’t just an innocent third party, as it may have been during the Cold War, it was an active participant in deception. Ed.